It's not all that long since Facebook started to allow users to broadcast live video to their friends and followers -- now the social network is doing the same with audio. Things are looking good for mobile users, particularly those with Android devices. Starting off with partners such as the BBC World Service, LBC and Harper Collins, Live Audio is something of a blend of podcasts and radio. To start off -- just as happened with live video -- audio broadcasting will only be available to a select group of companies, but there are plans to open it up to everyone. The new streaming format means that broadcasters (and, ultimately, everyone) will be able to stream audio-only content without the need to think about accompanying video footage. There is a choice of broadcasting audio on its own, or having a still image displayed at the same time -- something which companies are likely to jump on for branding purposes. We know that sometimes publishers want to tell a story on Facebook with words and not video. We’ve even seen some Pages find creative ways to go live and reach audiences with audio only by using the Facebook Live API or by adding a still image to accompany their audio broadcast. Our new Live Audio option makes it easy to go live with audio only when that’s the broadcaster's preferred format. We also know that publishers sometimes go live from areas that lack strong network connectivity. Though we alert the broadcaster if their signal is low, Live Audio presents another option for connecting with audiences in real time from low-connectivity areas. From interviews to book readings, we're excited about the layer of interactivity that Live Audio brings to both the broadcaster and listener. 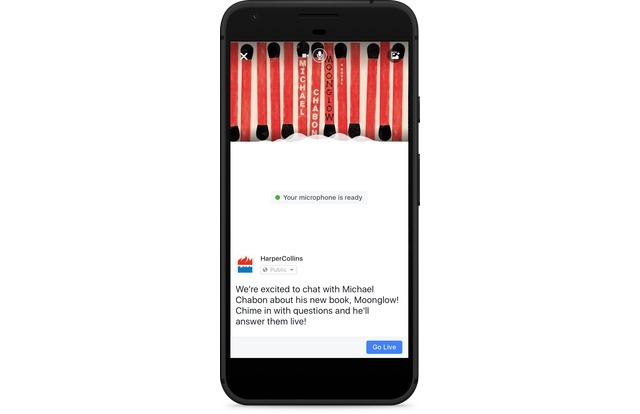 Just as with a live video on Facebook, listeners can discover live audio content in News Feed, ask questions and leave reactions in real time during the broadcast, and easily share with their friends. We mentioned that Live Audio is great for mobile users. For anyone running iOS, it will be possible to keep audio playing whilst browsing other parts of Facebook -- there's no need to remain on the post containing the broadcast. But things are even better for Android users as it will be possible to navigate out of the app and keep the audio playing in the background while getting on with other things.